The Camp Fire was started by downed power lines, spread from a forest, and then became a structure-to-structure urban fire in which houses burned but many trees did not. I grew up in southern California on the edge of the San Fernando Valley. Fires, usually fueled by Santa Ana winds on dry grasses in the hills, were a fact of life. I evacuated. I ran the pump to squirt water from the pool onto the roof. I helped neighbors on the edge of the hills water their roofs. Back in those days, in the 1970s, fires over 100,000 acres (~150 square miles) were rare. The worst fires destroyed 200 to 300 homes. Rarely, someone died. That was then. Infographic prepared in 2013, before most of the recent mega-fires. Twelve years ago, four researchers examined a comprehensive database of all large wildfires in western United States forests since 1970. They detected a signal and concluded that “large wildlife activity increased suddenly and markedly in the mid-1980s.” Looking at weather data and land-use history, they concluded the driving factor was “increased spring and summer temperatures and an earlier spring snowmelt”. Forest management, on the other hand, had “relatively little effect”. Published in the journal Science in 2006, they had found the “force multiplier” that climate change brings to the West. We all knew that forests had been mismanaged for nearly a century, and that too many homes and towns had been built up against wildlands. But now there was a new factor driving fires—longer hotter drier summers. 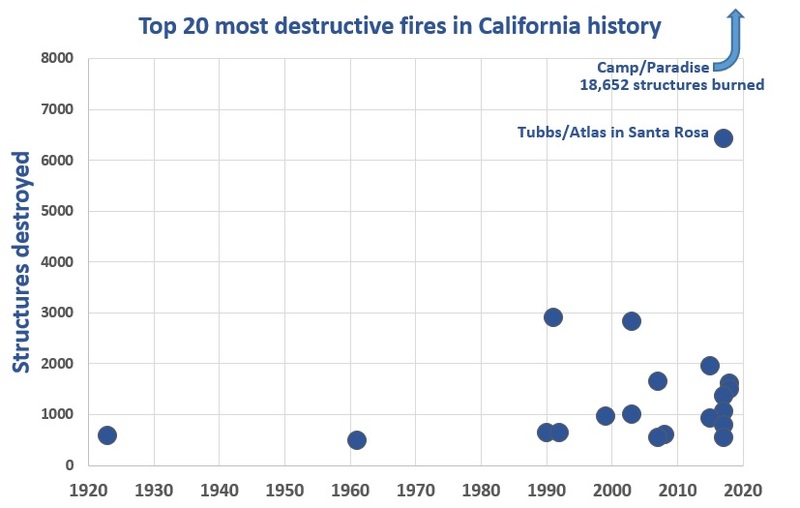 If you’re looking for numbers, the data show that fires really ramped up in 1987. The so-called “force multiplier” of climate change was big—about 3 or 4. That is, wildfire frequency was triple in dry years when compared to moderate years, and quadruple that in wet years. Ominously, they noted the effect was non-linear, meaning that, in warmer years, fires really increased. Thus, the multiplier was not just a constant number—it increased with temperature and lack of rain. The Berkeley Tunnel fire, which was exceptional because it killed 24 people trying to evacuate and was the first fire in California history to burn over a thousand homes (it actually burned over 2,000 homes), occurred in 1991. 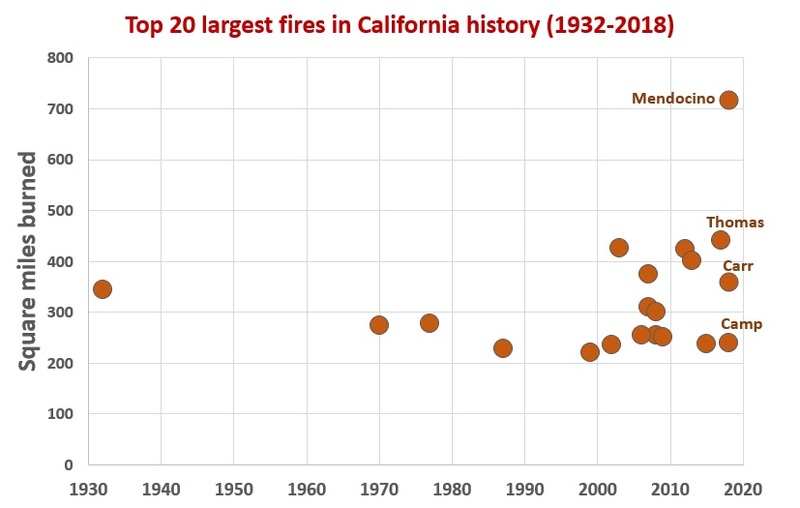 In the twelve years since the Science article, mega-fires, in terms of acres burned, structures destroyed, and people killed, have gone off the charts—literally. When it comes to fires that burn more than 200,000 acres (~300 square miles), destroy more than a thousand homes, and kill dozens, if not hundreds of people, climate change is not really a “force multiplier”, it’s an on-off switch. Such fires were very rare or non-existent before the year 2000. Now, they appear to be annual. We’ve crossed a threshold, tripped a wire. In 2017, after the astounding loss of 6,000 homes in Santa Rosa, we hoped that was an outlier, a blip in the data. A few months later, in December, when fires were previously unheard of, the Thomas Fire became the largest in state history. Barely six months later, the Carr Fire made Redding “the new Santa Rosa”. After that fire I posted a chart showing that 16 of the state’s largest 20 fires had all occurred in the past 20 years. We had a reached a “new abnormal”. Then, a few months after that, in November, when by all historical standards the fire season should be over, the Camp Fire literally wiped out the entire town of Paradise, population 26,000. Hospitals, high schools, stores, and houses, all gone. The death toll is without historical precedent. While that was burning, the Woolsey Fire became the largest and most destructive fire in the history of the Los Angeles area. At the present rate, next year the Paradise inferno will be surpassed by some hell unimaginable. 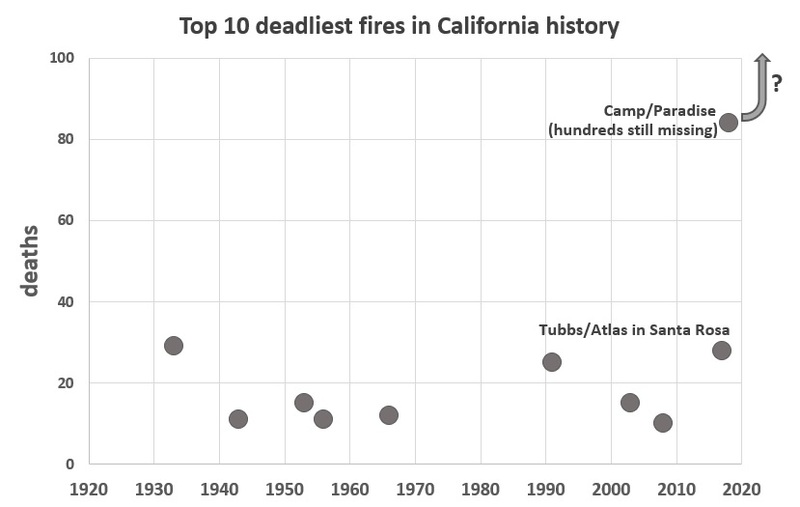 When I say the Camp Fire is the largest climate-induced mass mortality event in modern history, I’m not counting hurricanes. Hurricanes, even large hurricanes, have always occurred and always will. A Category 5 hurricane striking a major city is an inevitability. Yes, climate change has made hurricanes larger and more numerous, thus increasing the risk, but nothing like the change we’ve seen with fires in the West. Thus, attributing any one hurricane to climate change is like attributing a single specific cancer case to an environmental contaminant causing a cluster of cases. In the short run, we can’t stop the changing climate, the record low humidity and record high dry vegetation, or the longer summers. We can’t shorten the fire season, now 80 days longer than in 1970s. But we can modify power lines, conduct preventative burns, revise urban fire perimeter requirements, and re-evaluate evacuation routes. Those things won’t turn off the switch we’ve triggered, but they might at least save some homes and lives in the coming years. The CalFire damage inspection map of Paradise. The latest interactive map can be found here. Why are so many Eurasian Collared-Doves leucistic?